At times wondrous and somewhat exhilarating, 'The Hobbit: An Unexpected Journey' is an expedition that labors and plods through a wealth of exposition with very little progress or feeling of accomplishment, let alone satisfaction. Like bread crumbs leading audiences to their possible doom, bits of information are laid out before us and are intended to play more significant roles in later installments. Granted, a whole lot of swashbuckling action and heroic sword-fighting takes place along the way, but it's all for naught the moment we discover we're only a third into the overall adventure. And can you imagine; it only took 170 minutes to even get that far. Never mind, we're teased with the idea of cutting the journey shorter if only a certain smart-alecky gray wizard (Ian McKellen) would call on his extraordinarily-large feathered friends to aid a merry company of dwarves. To be fair, that climactic scene with the eagles is directly taken from J.R.R. Tolkien's novel, so the question of why everyone doesn't simply hitch a ride to their destination originates there. With the same CG spectacle and visual eye candy as seen in 'The Lords of the Rings' trilogy, director Peter Jackson returns to Middle-earth with the bloated idea of stretching a tale which Tolkien told in a single book into a three-part trilogy. A two-film series would have been more than sufficient and plenty fair, even at nearly three-hours each. Instead, Jackson designs a script, along with co-writers Philippa Boyens, Fran Walsh, and Guillermo del Toro, the latter of which was originally signed to direct, which expands that fantasy children's book by incorporating material from the original trilogy. The most obvious addition is Radagast the Brown (played to great comical effect by Sylvester McCoy), a character barely mentioned in the books but expanded in such a way as to play a major part in the plot. The filmmakers also co-mingle a few very minor but equally nonsensical scenes with their attempt at being a faithful adaptation. At the risk of sounding like a total nerd, it was awe-inspiring to hear a quieter, more haunting version of Neil Finn's rendition of "Song of the Lonely Mountain," but was it really necessary to see the dwarves sing and do the dishes just prior to that? Looking ahead and reading the titles of the next two installments, Tolkien fans can easily see how the book will be divided into two more parts: the next ending with the demise of Smaug, the fire-breathing dragon which seized the dwarves' mountain, and the final chapter showing the Battle of Five Armies. On some level, it seems reasonable to imagine The Hobbit as a trilogy, but it also feels somewhat overstuffed and slow-paced because of the added details. Nevertheless, in spite of what I see as minor drawbacks — much of which comes from my nerdy familiarity with the original book series, and as common sense would dictate, it's not fair to judge or compare the adaptation by the quality of its source — I found myself mildly entertained by Jackson's efforts. And honestly, I don't think I mind all that much some of the changes made in the plot and narrative. In fact, I rather like Radagast, bird-poop and all, even if his appearance really only serves to fill time. Jackson has the character play a key role that eventually connects this film series as a prequel to his previous trilogy. I also like that the filmmakers move hints of Sauron's slow return much earlier in time with Radagast discovering the Morgul-blade. It leads to an interesting discussion between Gandalf (McKellen), Galadriel (Cate Blanchett), Elrond (Hugo Weaving) and Saruman (Christopher Lee). In the middle of all this, Martin Freeman turns in a wonderful performance as the younger version of Ian Holm's Bilbo Baggins. Largely hesitant, timid, and anxiety-ridden, Freeman allows glimmers of a character with a great deal of potential for courage and plenty of room for growth, a likeable, witty hobbit who thinks quickly on his oversized, hairy feet. Richard Armitage, better known for his television roles and as Heinz Kruger in Marvel's 'Captain America' film, joins the mythological adventure as the leader of the company of dwarves, Thorin Oakenshield. With a large chip on his shoulder and the sort of pride that can become a liability, Armitage is splendid in the role, allowing the character a perfect balance of hard-headed foolishness and the daring bravery that makes him admirable. And finally, Andy Serkis reprises his role as the memorable and often astoundingly realistic Gollum while also serving as second-unit director for many of the action sequences. In the film's extended form, the 13 additional minutes cut into the narrative make very little difference to its overall enjoyment; they neither make it worse nor better. Some of the new scenes are so negligible, they can be easily overlooked; however, a few of the changes are apparent enough to spice things up, most notably a song and dance performed by the Great Goblin. The editing to incorporate this sequence into the film is a bit awkward and uneven, but it adds a tad of flavor. The most surprising and equally best scene is Bilbo and Thorin accidentally overhearing a private conversation between Gandalf and Elrond that actually adds the characterization of Thorin. But other than that, the rest are of little consequence to the overall film. For all its minor, and arguably forgivable, imperfections, 'The Hobbit: An Unexpected Journey' remains an entertaining fantasy adventure. It's no 'Lord of the Rings,' but it's a decent start in the right direction. 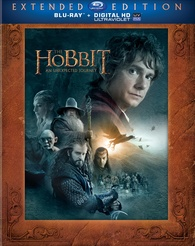 Warner Bros. Home Video brings 'The Hobbit: An Unexpected Journey: Extended Edition' to Blu-ray as a three-disc package with an UltraViolet Digital Copy code. Housed inside a black, eco-elite keepcase with a middle panel that holds two discs on either side, all three discs are Region Free, BD50s, and the whole thing comes with a sturdy, attractive slipcover lightly textured to simulate leather. This special edition of the film adds 13 additional minutes of dialogue and a pair of new songs to the theatrical runtime of 169 minutes, making this version a whopping 182 minutes. Viewers are taken straight to an animated main menu screen that tours the inside of Bilbo's house while music and audio clips from the film play in the background. The extended edition of 'Unexpected Journey' arrives to Blu-ray pretty much as expected with a 1080p/AVC MPEG-4 encode that looks identical to its predecessor, and that's not a bad thing. In fact, the video, including the new sequences, looks fantastic and rather remarkable. A consistently sharp and highly-detailed presentation displays every leaf in treetops, every blade of grass and every pebble on the road with resounding clarity. The costumes of each character shows every thread and stitching with extraordinary definition, and individual hairs in the beards are very distinct. Close-ups reveal pores, wrinkles and negligible blemishes with lifelike textures. Filmed entirely on a Red Epic camera system, the 2.40:1 image also displays a dazzlingly bold and colorful palette, even if the cinematography seems to favor the teal & orange aesthetic. Primaries are richly saturated and animated while a healthy assortment of secondary hues fills the screen with warmth and energy. A crisp, brilliant contrast allows for extraordinary visibility in the distance, exposing the tiniest objects in the background and the fine lines of various rock formations scattered throughout the New Zealand landscape. Black levels are true and inky, penetrating deep into the screen with luxurious gradations, while shadow details remain plain and sharply delineated. It's a splendid, demo-worthy high-def presentation fans will really enjoy. Like the video, Peter Jackson's return to Middle-earth comes with a DTS-HD Master Audio soundtrack that is, for the most part, the same one heard in the previous release. The only difference is the addition of the new scenes adding a bit more extension to the low-end, especially during the quirky song and dance performed by the Great Goblin. It's not the sort to ruin the foundation, but it's just enough to be felt in the couch. As for the rest of the movie, bass is the same as before, delivering plenty of oomph to each thump of the horses' hooves and stomp of a Warg's paw while battle scenes enjoy some wall-rattling excitement. Compared to 'The Lords of the Rings' movies, however, the bass could be stronger. Nevertheless, the lossless mix is reference quality with a mid-range that is amazingly extensive and broad, exhibiting the smallest detail with superb, crystal-clear clarity. The tiny pops and sizzles of crackling fire are perfectly audible, and distant, individual droplets of water while in Gollum's cave crash unto rocks with accurate, realistic definition. In action sequences, the upper ranges are precise and distinct, giving each roaring yell and clash of metal upon metal extraordinary intelligibility. Along with the excellent dynamic range, the bass provides an appreciable role in Howard Shore's thrilling musical score, adding a great deal of depth and weight to the orchestration, especially when hearing the cellos and the low-pitched brass instruments. Meanwhile, dialogue remains lucid and well-prioritized in the center. Rear activity is also filled with more excitement, as subtle ambient effects play almost non-stop throughout the film's runtime. All sorts of wildlife can be heard constantly making a racket in the distance, particularly in scenes with Radagast the Brown. As you'd expect from the several battles, arrows fly overhead, swords swing clear across the room and the goblins come in swarms from behind the listening area. Inside Gollum's cave, voices echo all around with remarkable realism, and panning is fluid and flawless, creating a stunning 360° soundfield that's immersive. Shore's music bleeds into the back channels and envelops viewers with exhilaration, making this a marvelous and highly-satisfying lossless mix audiophiles will absolutely love. Supplemental material adds to over ten hours of information and spread across all three discs (on DVD, that's five discs). Audio Commentary — A treasure-trove of information jam-packed with everything you'll ever need to know about the troubled production, this exhaustive commentary features Peter Jackson and co-writer Philippa Boyens reminiscing on the film's making. Everything from early development and challenges faced from the onset to the casting, stage design and the attempt at including every facet of Tolkien's novel is discussed in incredible detail and with enthusiasm. The pair chats almost endlessly from the beginning and don't let up until the end, making this every fan's dream commentary. Too bad there's only one. New Zealand: Home of Middle-Earth (HD, 7 min) — Travel with Peter Jackson and his crew through the various shooting locations across the New Zealand landscape and hear how they were transformed to represent Middle-earth. Introduction (HD, 2 min) — With a couple sneak peeks at 'The Desolation of Smaug,' Jackson welcomes fans to the appendices. The Journey Back to Middle-Earth (HD, 48 min) — A closer look at the making with tons of interviews and BTS footage, touching on everything from challenges in the production, the costuming, the physical demands on the cast, shooting locations and special effects. Riddles in the Dark (HD, 17 min) — As the title hints, fans can enjoy Martin Freeman and Andy Serkis rehearsing the memorable scene. An Unexpected Party (HD, 25 min) — Focused on an early scene in Bag End, this is a detailed look at the latest in motion-capture technology along with traditional movie magic. Roast Mutton (HD, 17 min) — Another look at motion-capture during the troll scene and the challenges involved. Bastion of the Greenwood (HD, 11 min) — Cast and crew prepare and work on Radagast the Brown and his sleigh of CG rabbits. A Short Rest (HD, 29 min) — Brief glimpses at Ian McKellan, Cate Blanchett, Hugo Weaving, Christopher Lee, Ian Holm and Elijah Wood make preparation to reprise their roles. Over Hill (HD, 14 min) — A look at the difficulties and challenges in making the Misty Mountains scene. Under Hill (HD, 19 min) — The practical effects work and acting that went into the Goblin kingdom scene prior to the magic of CGI. Out of the Frying Pan (HD, 16 min) — The final climatic battle against Azog pre-digital effects. Return to Hobbiton (HD, 19 min) — A special gathering for Old Took's party scene where Gandalf first meets Bilbo. The Epic of Scene 88 (HD, 8 min) — Follows the cast and crew as they shoot the Warg chase sequence and racing from one shooting location to the next. The Battle of Moria (HD, 11 min) — A few minutes is dedicated to the making of the opening prologue. Edge of the Wilderland (HD, 23 min) — Interviews and footage at movie's wrap showing the camaraderie of everyone involved. Home is Behind, the World Ahead (HD, 12 min) — A look at the editing with Jabez Olsen, putting the finishing touches to the film and a few glimpses of things to come for fans to enjoy. The Company of Thorin (HD, 63 min) — A detailed documentary broken into six parts discussing the personal histories of each dwarf with lots of interviews and BTS footage. Mr. Baggins: The 14th Member (HD, 16 min) — As the title suggests, Martin Freeman's performance is the center of attention. Durin's Folk: Creating the Dwarves (HD, 57 min) — Another documentary on the company of dwarves but this time devoted to the people who brought them to life, from concept art and costumes to the artist at WETA. The People and Denizens of Middle-Earth (HD, 58 min) — A four-part doc focuses on the other creatures (trolls and goblins) and characters (Radagast and Azog) seen throughout. Realms of the Third Age: From Bag End to Goblin Town (HD, 59 min) — Another hour-long doc with a closer look at the stage design of various places and localities within the Middle-earth universe. The Songs of The Hobbit (HD, 33 min) — As one could guess, the final piece is dedicated to adapting the songs and creating the music for each. Although failing to reach the heights of the original 'Lord of the Rings' trilogy, Peter Jackson's return to Middle-earth is nevertheless a mildly enjoyable fantasy adventure. Minor, negligible quips with the filmmakers bloating a single book into three films aside, 'The Hobbit: An Unexpected Journey' makes for a decent start to a larger trilogy that will hopefully provide a more satisfying piece of entertainment. The Blu-ray arrives with spectacular, demo-worthy video and a reference-quality audio presentation. 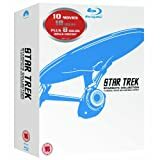 Supplements for this Extended Edition are extensive and exhaustive with hours of information for fans to enjoy, making the overall package the preferred recommended purchase over the previous release.